"Club Cooee" is a Messenger chat program in 3D , which it allows users (created 3D avatars), together to chat, to meet in virtual spaces, images and link exchange websites. The program allows users to talk to each other in chat rooms, music to listen to, videos to watch, share photos and links to put on websites. The communication is based not on pure text messages as in traditional chat programs, but there are Custom 3D avatars that enter into a three-dimensional multimedia environment in contact. Users can create their own spaces and equip with individual music and video files so that in the premises as the favorite music is played and any device can be assembled. Alternatively, you may also be from different predefined space (known as "" Club Cooee "scenes") to select. Companies can create their own virtual spaces and offer their products for example. From the pictures of the products in the 3D space can links on their website. The window of the 3D messenger program is not in the browser , but as a widget directly on the desktop interface and thus runs parallel to other applications. After you download the program and register as a user you can design your own avatar as you like, so that the pure messaging is supplemented by a personal component. Then you can chat with other avatars, face to face. 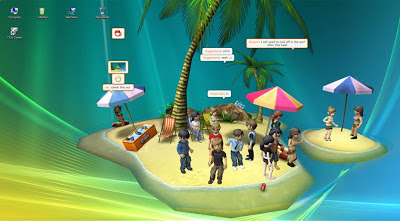 The program expands the traditional instant messaging to multimedia components in 3D, so the picture and sound just like a video game to get an important function. The individual design it feels like to get to know the other person actually.